ถึงแม้ว่าอ็องรีจะเล่นในตำแหน่งกองหน้าตัวเป้าตั้งแต่ครั้งอยู่ในชุดเยาวชน แต่เมื่อเขาอยู่กับโมนาโกและยูเวนตุส เขาก็ได้เล่นในตำแหน่งปีก จนเมื่ออ็องรีเข้ามาอยู่กับอาร์เซนอลในปี ค.ศ. 1999 แวงแกร์ก็ได้เปลี่ยนตำแหน่งการเล่นเขาทันที โดยเปลี่ยนมาเล่นในตำแหน่งที่เขาเคยเล่นสมัยเยาวชน โดยจะเล่นคู่กับเพื่อนร่วมทีมชาวดัตช์ที่มากประสบการณ์อย่าง แด็นนิส แบร์คกัมป์ ในฤดูกาล 2004–05 แวงแกร์เปลี่ยนรูปแบบการเล่นของอาร์เซนอลมาเป็น 4–5–1 การเปลี่ยนรูปแบบการเล่นนี้ทำให้อ็องรีต้องปรับตัวอีกครั้ง มีหลายเกมที่เขาเล่นเป็นกองหน้าตัวเป้าคนเดียว อ็องรียังคงเป็นผู้เล่นแนวรุกที่สำคัญของอาร์เซนอล มีหลายครั้งสามารถยิงประตูได้น่าตื่นเต้นดุจดั่งเวทมนตร์ แวรแกร์เคยพูดถึงเขาไว้ว่า "ตีแยรี อ็องรี สามารถที่จะนำพอลได้จากกลางสนามและสามารถยิงประตูที่ไม่มีใครในโลกสามารถยิงได้"
รางวัลรองเท้าบูตทองคำพรีเมียร์ลีก (4): 2001–02, 2003–04, 2004–05, 2005–06. ในปี ค.ศ. 2004 อ็องรีเซ็นสัญญากับบริษัทผลิตเครื่องกีฬาไนกี้ หนึ่งในโฆษณาที่เขาได้เลี้ยงลูกฟุตบอลหลบดาราฟุตบอลคนอื่นอย่าง โกลด มาเกเลเล, เอ็ดการ์ ดาวิดส์ และเฟรดริก ยุงแบร์ (Fredrik Ljungberg) ในสถานที่อย่างเช่นห้องนอนและห้องรับแขก ในโฆษณาชิ้นนี้ได้รับแรงบันดาลใจส่วนหนึ่งจากชีวิตของเขาเอง ที่เขามักจะเล่นฟุตบอลในสถานที่แบบนั้น อย่างเช่นในบ้าน อ็องรียังเล่นในโฆษณาที่ชื่อ "ซีเครตทัวร์นาเมนต์" (Secret Tournament) ที่มีดาราฟุตบอลอีก 24 คนอย่างเช่น ยุงแบร์, รอนัลดีนโย และฟรันเชสโก ตอตตี ต่อจากนั้นในฟุตบอลโลก 2006 เขาแสดงในโฆษณาที่ใช้ชื่อในภาษาโปรตุเกสว่า Joga Bonito มีความหมายว่า "เกมที่สวยงาม"
↑ 1.0 1.1 "FIFA World Cup South Africa 2010 – List of Players" (PDF). Fédération Internationale de Football Association (FIFA). สืบค้นเมื่อ 5 June 2013. ↑ 2.00 2.01 2.02 2.03 2.04 2.05 2.06 2.07 2.08 2.09 2.10 2.11 2.12 2.13 2.14 2.15 2.16 2.17 2.18 "Goal.com Profile: Thierry Henry" (web archive). Goal.com. 25 June 2007. Retrieved 23 September 2007. ↑ 3.00 3.01 3.02 3.03 3.04 3.05 3.06 3.07 3.08 3.09 3.10 3.11 3.12 3.13 3.14 "Thierry Henry Bio". JockBio. Retrieved 5 May 2008. ↑ 4.0 4.1 4.2 4.3 4.4 4.5 4.6 4.7 Anthony, Andrew (3 October 2004) "Thierry Henry, you're having a laugh". The Observer. Retrieved 18 May 2008. 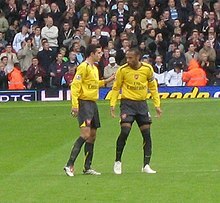 ↑ O'Connor, Ashling; Smith, Ben (19 November 2009) "Sponsors stand by Thierry Henry but fans call for boycott over handball". The Times. Retrieved 10 December 2009. ↑ 6.0 6.1 "Thierry Henry returns: factfile". The Independent. Retrieved 11 January 2012. ↑ 7.0 7.1 7.2 7.3 7.4 7.5 "Henry". footballdatabase.com. Retrieved 23 December 2011. ↑ "Soccerbase stats for AS Monaco Semi Final game". Soccerbase. Retrieved 30 September 2007. ↑ 9.0 9.1 9.2 Clarke, Richard (14 November 2006) "Henry – Why I must adapt to our new formation". Arsenal F.C. Retrieved 26 March 2007. Archive copy ที่ เวย์แบ็กแมชชีน. ↑ "Thierry Henry – France". CBC.ca. Retrieved 30 September 2007. ↑ "Henry joins Arsenal in record deal". BBC Sport. 3 August 1999. Retrieved 10 January 2011. ↑ Harris, Nick (4 August 1999) "Henry adds to Arsenal's firepower". The Independent. Retrieved 3 January 2011. ↑ 13.0 13.1 13.2 13.3 "Ronaldinho wins Fifa player award". BBC Sport. 20 December 2004. Retrieved 1 January 2012. ↑ "Games played by Thierry Henry in 1999–2000". Soccerbase. Retrieved 25 March 2007. ↑ 15.0 15.1 15.2 15.3 15.4 "Thierry Henry". ESPN Soccernet. Retrieved 30 September 2007. ↑ "Gunners take home Cup". The Football Association. 17 May 2003. Retrieved 13 February 2011. ↑ Freedman, Dan (17 May 2003) "Gunners take home Cup". The Football Association. 17 May 2003. Retrieved 24 April 2007. ↑ 18.0 18.1 "Past Footballers of the Year". Pub Quiz Help. Retrieved 31 May 2011. ↑ 19.0 19.1 19.2 19.3 19.4 "Henry to stay a Gunner until 2010". BBC Sport. 19 May 2006. Retrieved 1 January 2012. ↑ Hughes, Ian (15 May 2004) "Arsenal the Invincibles". BBC Sport. Retrieved 1 January 2012. ↑ 21.0 21.1 21.2 21.3 "Tiger Woods, Roger Federer and Thierry Henry Are Introduced As the Faces of the New Gillette Champions Program". Procter & Gamble. 4 February 2007. Retrieved 22 March 2007. ↑ "Games played by Thierry Henry in 2004/2005". Soccerbase. Retrieved 26 March 2007. ↑ Lowe, Sid (22 February 2006) "Wenger hopes Henry will stay and usher in new era". The Guardian. Retrieved 26 March 2007. ↑ 24.0 24.1 Winter, Henry (22 October 2005) "Record-breaking Henry still a master of humility". The Daily Telegraph. Retrieved 25 March 2007. ↑ "Thierry Henry eases to scoring record". China Daily. 22 October 2005. Retrieved 22 March 2007. ↑ "Arsenal 2–3 West Ham". BBC Sport. 1 February 2006. Retrieved 1 January 2012. ↑ 28.0 28.1 "Arsenal rejected 50 million-pound bids for Henry, says Dein". China Daily. 22 May 2006. Retrieved 26 March 2007. ↑ 29.0 29.1 "Wenger: Henry staying with Gunners". ESPN Soccernet. 6 April 2007. Retrieved 7 April 2007. ↑ Clarke, Richard (7 March 2007) "Wenger – The hidden benefits of having Henry". Arsenal F.C. 7 March 2007. Retrieved 31 May 2011. 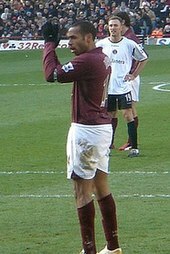 ↑ Clarke, Richard (8 March 2007) "Henry ruled out for the remainder of season". Arsenal F.C. 8 March 2007. Retrieved 31 May 2011. ↑ "Thierry Henry signs for Barcelona". The Nation. 23 June 2007. Retrieved 22 July 2007. ↑ "Henry seals deal with Barcelona". Daily Express. 25 June 2007. Retrieved 28 June 2007. ↑ "Arsenal announce Henry departure". BBC Sport. 23 June 2007. Retrieved 1 January 2012. ↑ "Henry hoping Wenger remains Gunners' boss". ESPN Soccernet. 26 June 2007. Retrieved 15 October 2007. ↑ 37.0 37.1 "Fabregas was right about me, says Henry" ESPN Soccernet. 14 October 2007. Retrieved 15 October 2007. ↑ 38.0 38.1 "Gunners' Greatest Players – 1. Thierry Henry". Arsenal F.C. Retrieved 2 March 2011. Archive copy ที่ เวย์แบ็กแมชชีน. ↑ "Thierry Henry scores as Barcelona take charge". The Daily Telegraph. 20 September 2007. Retrieved 23 September 2007. ↑ "The year in pictures". FIFA. 23 December 2009. Retrieved 12 March 2010. ↑ "Barcelona happy for Henry to leave". The Independent. 5 May 2010. Retrieved 14 July 2010. ↑ "Henry and Toure to leave Barcelona". Reuters. 28 June 2010. Retrieved 14 July 2010. ↑ "New York Red Bulls sign international star Thierry Henry". New York Red Bulls. 13 July 2010. Retrieved 15 July 2010. ↑ "Standings". Major League Soccer. Retrieved 26 December 2011. ↑ "Earthquakes advance". ESPN Soccernet. 5 November 2010. Retrieved 26 December 2011. ↑ "2011 MLS Standings & Leaders". Major League Soccer. Retrieved 27 December 2011. ↑ "Thierry Henry joins Arsenal from New York Red Bulls". BBC Sport. 6 January 2012. Retrieved 6 January 2012. ↑ McNulty, Phil (9 January 2012) "Arsenal 1–0 Leeds". BBC Sport. Retrieved 10 January 2012. ↑ "Arsenal 7-1 Blackburn". ESPN Star. 4 February 2012. Retrieved 6 February 2012. ↑ "Thierry Henry open to third Arsenal spell - if asked". BBC Sport. 11 February 2012. Retrieved 12 February 2012. ↑ "A striking comparison". The Football Association. Retrieved 26 March 2007. ↑ 53.0 53.1 "2006 FIFA World Cup – Thierry Henry, top scorer and role model". UNICEF. Retrieved 26 March 2007. ↑ "Décret du 24 juillet 1998 portant nomination à titre exceptionnel", Journal Officiel de la République Française. 25 July 1998. Retrieved 12 March 2009. ↑ "France 2–1 Portugal". UEFA. 28 June 2000. Retrieved 23 March 2007. Archive copy ที่ เวย์แบ็กแมชชีน. ↑ "France 2–1 Italy". UEFA. 2 July 2000. Retrieved 23 March 2007. Archive copy ที่ เวย์แบ็กแมชชีน. ↑ "Thierry Henry". Sports Illustrated. Retrieved 9 July 2009. ↑ "France 0–1 Greece". BBC Sport. 25 June 2004. Retrieved 1 January 2012. ↑ Stevenson, Jonathan (9 July 2006) "Italy 1–1 France (aet)". BBC Sport. 9 July 2006. Retrieved 1 January 2012. ↑ "Sent-off Zidane named best player". BBC Sport. 10 July 2006. Retrieved 1 January 2012. ↑ "Ronaldinho regains FifPro crown". BBC Sport. 6 November 2006. Retrieved 1 January 2012. ↑ "France 2–0 Lithuania: Henry smashes Platini record". ESPN Soccernet. 17 October 2007. Retrieved 18 October 2007. ↑ "Henry reaches 100-cap milestone". BBC Sport. 3 June 2008. Retrieved 1 January 2012. ↑ "Villain Henry as Ireland, Ukraine, Russia exit in play-offs". ESPN Soccernet. 18 November 2009. Retrieved 19 November 2009. ↑ "Defiant Domenech condemns Henry backlash". ESPN Soccernet. 24 November 2009. Retrieved 10 December 2009. ↑ Ley, John (20 November 2009) "Arsene Wenger urges France to replay World Cup match after Thierry Henry handball". The Daily Telegraph. Retrieved 10 December 2009. ↑ "Defiant Domenech condemns Henry backlash". ESPN Soccernet. 24 November 2009. Retrieved 26 November 2009. ↑ "Thierry Henry contemplated international retirement". South Wales Echo. 23 November 2009. Retrieved 27 November 2009. ↑ "Thierry Henry: Replay the "fairest solution" for Ireland". ESPN Soccernet. 20 November 2009. Retrieved 26 November 2009. ↑ Ziegler, Martyn (3 December 2009) "Henry's 'blatant unfair play' could lead to ban in South Africa". Yorkshire Post. Retrieved 9 December 2009. ↑ Eason, Kevin (1 December 2009) "Henry consoled after death threats to family". Herald Express. 1 December 2009. Retrieved 9 December 2009. ↑ "FIFA not to take any action against Henry handball". ESPN Soccernet. 18 January 2010. Retrieved 20 January 2010. ↑ "Domenech: Player protest was 'stupid'". ESPN Soccernet. 21 June 2010. Retrieved 23 June 2010. ↑ "Thierry Henry retires from internationals to concentrate on New York mission – and gets ready for an Irish American backlash". Daily Mail. 16 July 2010. Retrieved 18 July 2010. ↑ Hatherall, Chris (30 October 2006) "Henry defends Arsenal's pursuit of beautiful game". The Independent. Retrieved 23 April 2007. Archive copy ที่ เวย์แบ็กแมชชีน. ↑ Clarke, Richard (17 July 2007) "Wenger – Don't compare Eduardo to Henry". Arsenal F.C. Retrieved 27 July 2007. Archive copy ที่ เวย์แบ็กแมชชีน. ↑ Hansen, Alan (13 March 2006) Alan Hansen's column". BBC Sport. Retrieved 1 January 2012. ↑ "Papin: attack at the double". BBC Sport. 12 April 2002. Retrieved 1 January 2012. ↑ ""English Debate: Can Arsenal Lift Major Silverware This Campaign?". Goal.com. 22 September 2008. Retrieved 22 September 2008. ↑ "Henry ready to get ugly". Sporting Life. 28 August 2003. Retrieved 30 October 2007. ↑ "Thierry Henry". Premier League. Retrieved 25 July 2007. ↑ "Fifa names greatest list". BBC Sport. 4 March 2004. Retrieved 1 January 2012. ↑ "Thierry Henry: The wizard of Highbury". Australian Broadcasting Corporation. 25 April 2006. Retrieved 27 March 2007. ↑ Lacey, David (30 August 2003) "The best player in the world is wearing Arsenal's colours". The Guardian. Retrieved 27 March 2007. ↑ Ingle, Sean (11 July 2006) "First half good, second half not bad either". The Guardian. 11 July 2006. Retrieved 27 March 2007. ↑ "Wenger: Henry is the world's greatest". China Daily. 7 November 2005. Retrieved 27 March 2007. ↑ Raynor, Dominic (7 November 2007) "Your Verdict: 100 greatest ever footballers". ESPN Soccernet. 7 November 2007. Retrieved 10 November 2007. ↑ Brown, Oliver (11 December 2008) "Cristiano Ronaldo pipped by Fernando Torres in Premier League popularity stakes". The Daily Telegraph. 11 December 2008. Retrieved 12 December 2008. ↑ Caroe, Charlie (10 December 2008) "Former Arsenal striker Thierry Henry all-time fans' favourite Premier League footballer". The Daily Telegraph. 10 December 2008. Retrieved 31 October 2011. ↑ Bellwood, Tom (18 December 2009) "The List: Top 50 players of the decade in the Premier League - Nos 10-1". Daily Mail. 18 December 2009. Retrieved 31 October 2011. ↑ "Arseanl Unveil Statues of Three Legends". Arsenal F.C. Retrieved 12 December 2011. ↑ "Thierry Henry History". ESPN Soccernet. Retrieved 23 December 2011. ↑ "Barcelona FC's player statistic for Thierry Henry". FC Barcelona. Retrieved 5 June 2009. ↑ "Henry, Thierry". National-Football-Teams. Retrieved 3 August 2009. ↑ "Thierry Henry". FIFA. Retrieved 2 January 2012. ↑ "Thierry Henry". French Football Federation. Retrieved 2 January 2012. ↑ Mamrud, Roberto (17 September 2010) "Thierry Henry – Century of International Appearances". Rec.Sport.Soccer Statistics Foundation. Retrieved 3 January 2012. ↑ Thierry "Va Va Vooms Away From Wife". Sky News. 16 July 2007. Retrieved 19 July 2007. 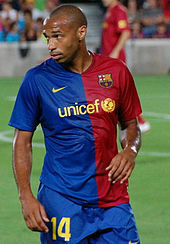 ↑ 105.0 105.1 "Famous Fathers: Thierry Henry". FQ magazine. Retrieved 26 March 2007. ↑ "Henry's wife is granted divorce". BBC News. 3 September 2007. Retrieved 1 January 2012. ↑ "Thierry Henry pays wife £8m divorce settlement". The Daily Telegraph. 5 December 2008. Retrieved 5 December 2008. ↑ 108.0 108.1 "The Dish: Thierry Henry". National Basketball Association. June 2001. Retrieved 20 June 2007. ↑ "Your Gripping NBA Champions". Deadspin. 15 June 2007. Retrieved 20 June 2007. ↑ "Aragones fined for Henry remarks". BBC Sport. 1 March 2005. Retrieved 1 January 2012. ↑ "Family urged Aragones to resign". BBC Sport. 1 December 2004. Retrieved 1 January 2012. ↑ "Caborn welcomes anti-racism stand". BBC Sport. 9 February 2005. Retrieved 1 January 2012. ↑ Parker, Tony (3 May 2007) "Thierry Henry". Time. Retrieved 20 October 2007. ↑ "Thierry Henry". Look to the Stars. Retrieved 25 February 2009. ↑ "Ronaldinho's brand worth more than Beckham's". Reuters. 30 May 2006. Retrieved 27 March 2007. ↑ "The Rich List top ten...". Daily Mail. 6 December 2006. Retrieved 27 March 2007. ↑ Va-va-voom is in the dictionary. Newsround. 8 July 2004. Retrieved 1 January 2012. ↑ ""Henry loves home match". Daily Mirror. 30 May 2004. Retrieved 19 February 2009. ↑ Stevenson, Seth (17 April 2006) "Keep Soccer Beautiful!". Slate. Retrieved 24 March 2007. ↑ Bond, David (12 April 20060 "Henry drops bombshell by moving to Reebok". The Daily Telegraph. 12 April 2006. Retrieved 27 March 2007. ↑ "Reebok gets the Picture". Reebok. Retrieved 5 March 2008. ↑ "Official Henry to wear Puma boots". FootballBoots.co.uk. Retrieved 3 August 2011. ↑ "Smack Talkin' Tiger" (with clips). gototennis. 13 July 2008. Retrieved 1 January 2012. ↑ "Boycott threat to Gillette products over Thierry Henry 'handball' row". The Daily Telegraph. 21 November 2009. Retrieved 9 December 2009. ↑ Mitchell, Susan (10 April 2005) "Footballers kick off Pepsi campaign". The Sunday Business Post. 10 April 2005. Retrieved 28 January 2008. หน้านี้แก้ไขล่าสุดเมื่อวันที่ 24 มีนาคม 2562 เวลา 12:04 น.